There was a sea sick warning when we booked the whale watching tour. But how bad can it be? It was the choice between going stomach to tail with one of the largest mammals on earth and a little bit of physical discomfort. 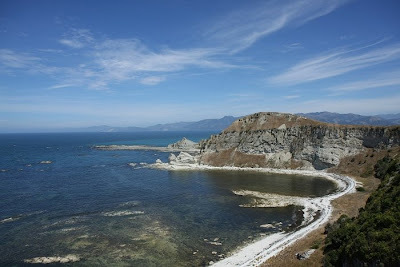 It was just a warning after all and whale watching is a must in Kaikoura. So we ended up on a catamaran chasing sperm whales. We had taken some meds prior to the ride to counter the effects of the boats motion. At first it seemed to be quite effective. Even Regula, who is very sensitive to motion sickness, was happily moving about the cabin and going outside to watch the first whale from up close. From then on though, things got bad. Obviously the meds somehow lost their magic after the first whale had wiggled its tail and disappeared back into the depths of the ocean. Regula was puking her guts out for the rest of the journey and I filled a bag or two as well. The only consolation was, that the guy sitting next to us was also green in the face although he had been serving in the British navy for 21 years. It seems that sea sickness is not something you can get rid off, even when you look like a bear and work on it for half your life. 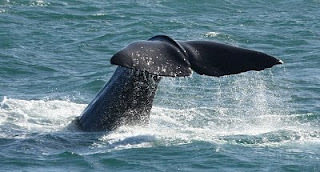 Fortunately for me, the worst passed between the two whale sightings, so I did snap some good pictures. Tomorrow we are off to Abel Tasman. Regula is researching ways of seeing the park without setting foot on a boat. She has my full support.